Prior to enrolling in Parsons New School of Design in 2016, Japanese designer Kota Okuda had attended London’s fashion academy Central Saint Martins for jewelry design and never used a sewing machine before. Recently, Okuda presented his thesis collection together with 14 other graduates from Parsons New School of Design’s MFA program during its yearly runway show. The event coincided with 2018’s New York Fashion Week, where Madonna’s daughter debuted the runway as a FernGully-like fairy in a body-chain bra. Okuda’s first assortment of apparels have caught a good deal of attention for their intentionally impractical yet highly amusing designs. 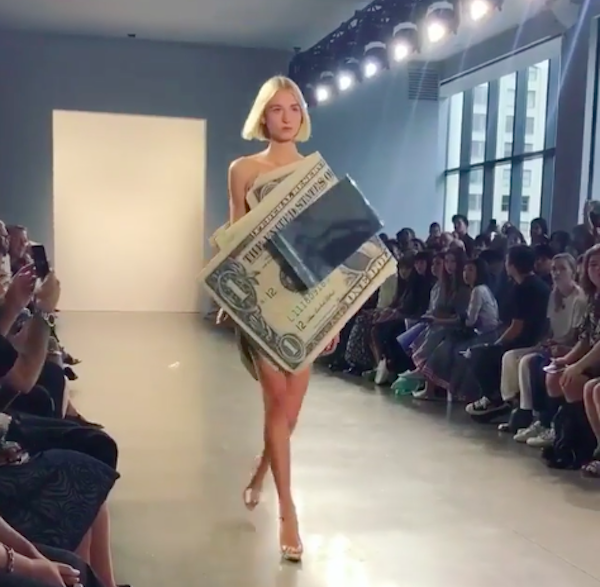 By exaggerating dollar bills crafted from different materials and fabrics including metal, acrylic, and plastic-like alternatives, the designer explores the relationship between materialism in the US and commodification of physiques. Ironically, the clothes have already caught the interest of celebrities including Nicki Minaj. Read the full interview here and see more of the Okuda’s first clothing collection that flaunts the almighty dollar below.